It’s about a possum what fights lizards in a suit of armour with only a jetpack and a sword. Of course I’m reviewing it! 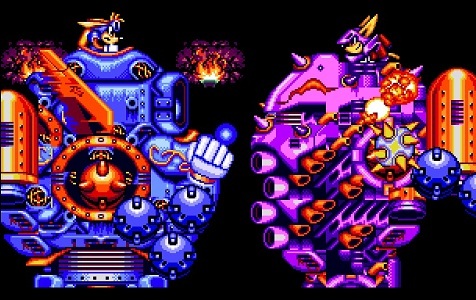 Officially, the Mega Drive/Genesis version of Sparkster is ‘Rocket Knight Adventures 2’, which is a subtitle designed to separate it from the SNES Sparkster game of the same name. Why they decided to do this and yet give bother versions identical box-art is beyond me. This is an even stranger decision when you realise that the SNES Sparkster is closer in terms of gameplay to Rocket Knight Adventures than Rocket Knight Adventures 2. 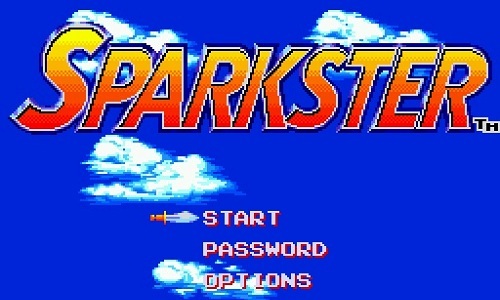 Sparkster controls the same as the first RKA, in that you have a button for Jumping, Attacking and Jetpacking, however the way that they function has fundamentally changed. He’s still the regular old Sparkster, tasked with saving the princess from the clutches of some agressive species (First pigs, then wolves, then lizards) while constantly doing battle with his arch rival Axle Gear the rogue rocket knight. Stages progress in a linear fashion, although there’s a decent amount of screen to move around in freely. 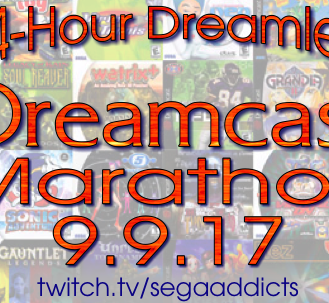 The organisation is actually more similar to Gunstar Heroes than Sonic, so the stages are actually pretty long, but they’re separated into smaller informal sections every time the gameplay feels like switching up. The first stage of Sparkster for example takes place in an open field before progressing to a thicker, viney jungle area before climaxing on-top of a moving truck. It also goes without saying that there’s about four bosses to destroy along the way, including the truck itself. This is 16-bit Konami after all. This time though, our hero has lost the ability to fire anything from his sword, which also means that the fantastic gradius-referencing stages from the original are also gone. Instead, the emphasis of combat is firmly in his abilities as a rocket knight, so you no longer have to charge up the jet-pack. Instead it automatically charges up, so any time the bar at the top of the screen is full he’s able to blast across the screen into foes at the press of a button. He even has a 2nd charge up level now which lets him add a kind of drilling motion to his jetpack sword attacks, a manoeuvre key to defeating some of the bosses you’ll find along the way, as well as a curious ground spin attack where he doesn’t move from the spot but unleashes a flurry of slashes in all directions around him. A lot of fans aren’t too fond of this shift to aerial antics rather than the regular run and slash fare, and certainly it does make the jetpack feel a little less special. It used to require a real understanding of the timing in tough battles, as you had to account for the charge up time as well as when to unleash the burst and inflict the maximum damage. Automatically charging means you just need to pick the best time to attack, which is certainly simpler but a not quite as dramatic if you’re just darting across the place. Also considering you no longer have any projectile attacks, you will pretty much have to always boost attack enemies, as regular slashing is now just too dangerous to consider an option. Especially when the spin-slash provides a much more effective close-range attack. With that said, this is still my favourite in the series, because it offered me something I didn’t get in any of the other games. The focus on boosting did loosen up the rest of the game, but similar to what web swinging did for the Spider-Man series of games the skill it takes to move at high speed and in really interesting directions was something you just didn’t get anywhere else in 1994. When Sonic was speeding around almost on rails, Sparkster could angle his boosts in tight corridors in order to maximise his damage output, collect as many bonuses as he needed and minimise the risk to himself. Early on you’re being chased by rolling adversary in exactly that sort of enclosed space, and it’s a real thrill to both angle and time your thrusts at the perfect time to escape danger and collect the necessary pick-ups to succeed. The variety of scenarios is a little lacking though from earlier games. I really found myself longing for the earlier shoot’em up style segments, and while the Spark-Robo battle at the start was a really exciting way to kick off a game, when it finally shows up in the story proper the stage is much too easy and overly long to elicit much recognition. The addition of hidden swords is a neat bonus, similar to Sonic titles allowing you to transform into a super-powered form for the finale, which really highlights how branching the levels are. Sparkster is a curious title in that in all its combined parts, it isn’t quite as good as the earlier games. It certainly doesn’t look or sound as nice as the SNES version, the hud and possum-on-beastie combat are missing a lot of the earlier charm. That said it’s still a really great game, and it mixes the joy of the rocketeering with the signature Konami elements of fluid, transforming bosses and fast action. When you’re blasting your boosters into the side of a boss in order to drill through and continue battling him on the other side, it’s flaws aren’t quite so easily apparent. It’s a game that on reflection has some glaring faults, but for as long as you’re playing it the experience is that of a great side-scrolling platformer with some really original mechanics that aren’t even matched by it’s modern day reimagining.